Masks, both diabolic and caricaturesque, are one of the principal motifs found throughout the entire artistic output of the Belgian painter James Ensor. Familiar from an early age with the masks sold in his parents’ shop for the traditional carnival of Ostend, his city of birth, the artist used them obsessively as a metaphor of the solitude of the individual in the new society of masses. This unsettling imagery, which links him to the great Flemish tradition of Bruegel and Bosch and the grotesque images of Daumier and Goya, whose phantasmagorical compositions he copied in his youth, make him unclassifiable as an artist. In his book on Ensor, the Belgian poet Émile Verhaeren furthermore likened the artist’s theatres of masks to Watteau’s fêtes galantes. Ensor’s highly personal oeuvre would also influence both the German Expressionists and the French Surrealists, and his mark can even be found in the deformations of De Kooning and Dubuffet. 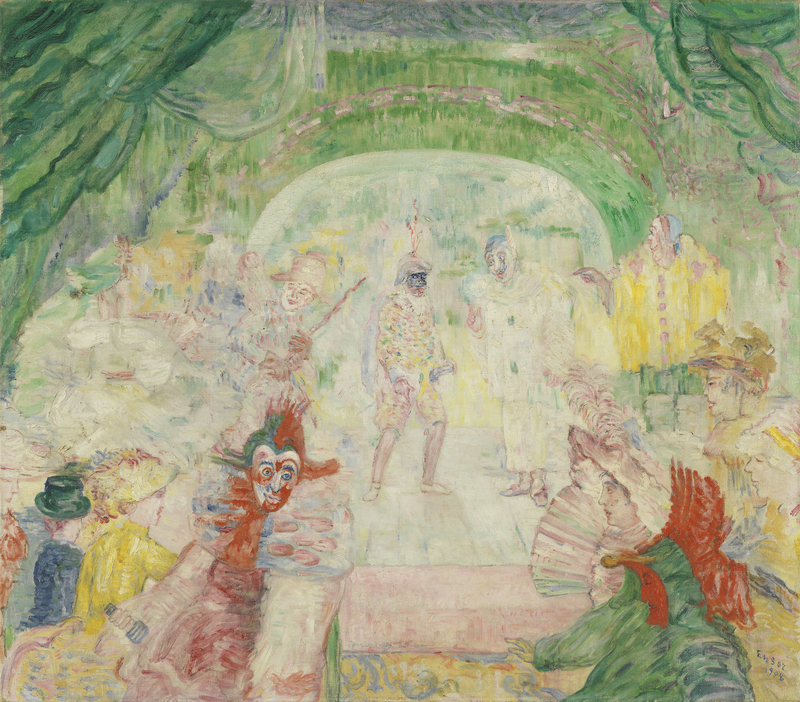 The Theatre of Masks in the Museo Thyssen-Bornemisza collection depicts a theatre performance on a well-lit stage in a style derived from Ensor’s own personal version of Symbolism. The masks concealing the actors’ faces blend in with the caricature masks of the audience who view the performance. The Musée Royal des Beaux-Arts in Antwerp has a very similar work to that in the Thyssen-Bornemisza. Although smaller in size, it is dated 1889 and no doubt stems from Ensor’s well known fondness for repeating his compositions on numerous occasions. In a letter to Baron Thyssen-Bornemisza, the eminent Swiss specialist in Impressionism François Daulte mentions that, as far as his friend Dr Fritz Trüssel (the previous owner of the painting) recalls, the gilt frame in the form of a stage was crafted on the artist’s instructions to heighten the trompe l’oeil effect.